Clean Carfax. The Mercedes GL-Class is a seven-passenger full-size SUV with refined styling, performance, luxury and safety in a package that is fairly reasonable in size compared to other vehicles in its class. With engines ranging from the 3.0-liter 50-state-legal clean diesel of the GL350 BlueTEC to the 5.5-liter V8 of the GL550 and a host of accessory packages, the GL-Class has broad appeal and makes tough competition for full-size SUV's such as the Cadillac Escalade, Lincoln Navigator, Lexus LX 570, Land Rover Range Rover and Infiniti QX56. If you are torn between a need for passenger and cargo room and a want for refined driving dynamics and appearance, the Mercedes GL-Class could be the solution for your dilemma. Those looking for fuel economy in the full-size SUV class would do well to give the GL350 BlueTEC a serious look. For 2011 the GL-Class will have Mercedes' new "mbrace" technology as standard. Mbrace features 24/7 assistance options along with real-time traffic monitoring and other conveniences, including remote door locking/unlocking. Mbrace also can be accessed via mobile phone application, taking personalization and convenience to a new level. Second and third-row seats in 2011 GL-Class models also have new head restraints designed to minimize whiplash occurrences. All three models also will offer an optional Blind Spot Assist. The 2011 GL550 gets a restyled bumper. The GL450 acquitted itself well in testing through variable road conditions including some serious bends and an aggressive off-road experience, especially with the Adaptive Damping System making its contribution. The GL450's nimble handling belies its size (curb weight is almost 5,300 pounds and overall length is around 200 inches); behind the wheel you may feel as if you're driving a smaller, lighter SUV. The seven-speed automatic's gear ratios are spaced close enough to each other to make the most of the GL450's 4.6-liter V8. While the GL450 may not have the off-road pedigree of other SUVs, such as the Range Rover, we liked the balance of practicality and capability it offered. Owners who want to push the GL450 without treating it as a pure hill-climber will find nothing lacking here. The Adaptive Damping System in the GL-Class constantly monitors and reacts to road surface changes and can alter shock absorber settings an astounding 20 times per second. Adaptive Damping makes the ride smoother or firmer as needed, giving the driver comfort on a smooth highway or the confidence of control as conditions worsen. The BlueTEC clean diesel engine clears every emissions requirement in the U.S. while allowing the driver to cruise nearly 600 miles on a single full fuel tank. With fuel prices in flux, the BlueTEC is a very attractive prospect, especially in a family-friendly SUV. The GL's eight-way power front seats offer four-way adjustable lumbar support, giving drivers near-endless ways to stay comfortable behind the premium leather multifunction steering wheel (or the Burl Walnut-accented steering wheel, available as an option). The third-row seats are easy to access and can fold down at the touch of a button along with the second row, creating just over 83 cubic feet of cargo room. Mercedes has gone out of its way to make every seating position in the GL-Class comfortable and enjoyable and that work pays off: It's one thing to fit seven adults in a single vehicle but to see that no one is stuck in the "bad" seat shows some true ingenuity. The GL-Class got some styling revisions for the 2010 model year and, save for the 2011 GL550's bumper, Mercedes has left those changes alone. Across the range, Mercedes has managed to deftly walk the fine line between expectations of the drivers of vehicles in this class and fans wary of the marque's foray into the distinctly modern full-size SUV category. At once elegant, assertive, powerful and subtle, the GL-Class is pleasant to observe and stands out without crossing a line into being gauche or over-the-top. At first glance the grille and sloping windshield could belong to any modern Mercedes sedan or coupe, but the lower front fascia and flared wheel wells plant the GL-Class firmly in SUV territory. Good sight lines along with the new optional Blind Spot Assist built into the exterior mirrors, bi-xenon headlamps and optional parking assist make the design of the 2011 GL-Class functional as well as stylish and help keep it that way. GL-Class models come with an impressive list of standard features, giving them a tremendous amount of value and really setting them apart from other SUVs in the class. Full-time four-wheel drive, brake assist, hill-start assist for high-angle takeoffs, the Electronic Stability Program and a full complement of airbags, including side-curtain protection extending through all three rows of seats, provide excellent safety for drivers and passenger alike. The in-dash six-disc CD/DVD fills the cabin with sound and allows drivers to watch DVD movies when the vehicle is in Park. Front and rear sunroofs are a nice touch, bringing an untypical ambiance to rear-seat passengers. The GL550 adds Mercedes' Comand voice control system to the stereo, navigation and Bluetooth features along with the harman/kardon LOGIC7 sound system and mp3/iPod connectivity. Even with all that the GL-Class includes as standard equipment, there is a litany of options to fit every driver's needs or wants. The Rear-Seat Entertainment System adds two eight-inch LCD screens to the backs of the front-seat head restraints, allowing passengers to watch DVDs, play video games or do both at the same time. Many options, including the Comand system, the harman/kardon LOGIC7 stereo, hard-drive navigation, Sirius Satellite Radio, iPod/mp3 interface, power rear liftgate and backup camera, can be had via packages or separately. Parktronic parking assist, Blind Spot Assist, a Class-IV trailer hitch and full leather seats are also available. 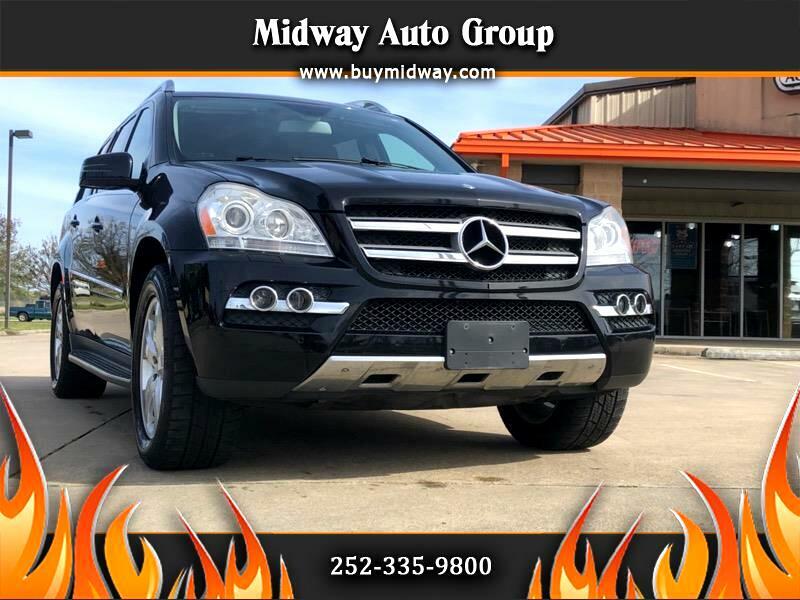 The 2011 GL-Class has three engine choices: The GL350's BlueTEC 3.0-liter diesel V6 stands out among diesels for its low-end torque, allowing quick acceleration while returning 21 miles per gallon highway. The wonderful 4.6-liter V8 in the GL450 is all about performance, swiftly delivering the force of its 335 horsepower and 333 pound-feet of torque across the full rpm spectrum. The GL550 packs a powerhouse 5.5-liter V8, churning out 382 horsepower and 391 pound-feet of torque. All 2011 GL-Class models send their power to all four wheels via a seven-speed automatic transmission with paddle shifters at the wheel if you like to take matters into your own hands. Message: Thought you might be interested in this 2011 Mercedes-Benz GL-Class.